Specially formulated for skin care, Aloveen Oatmeal Shampoo is highly effective in cleansing dog coat and keeping it clean and fresh. 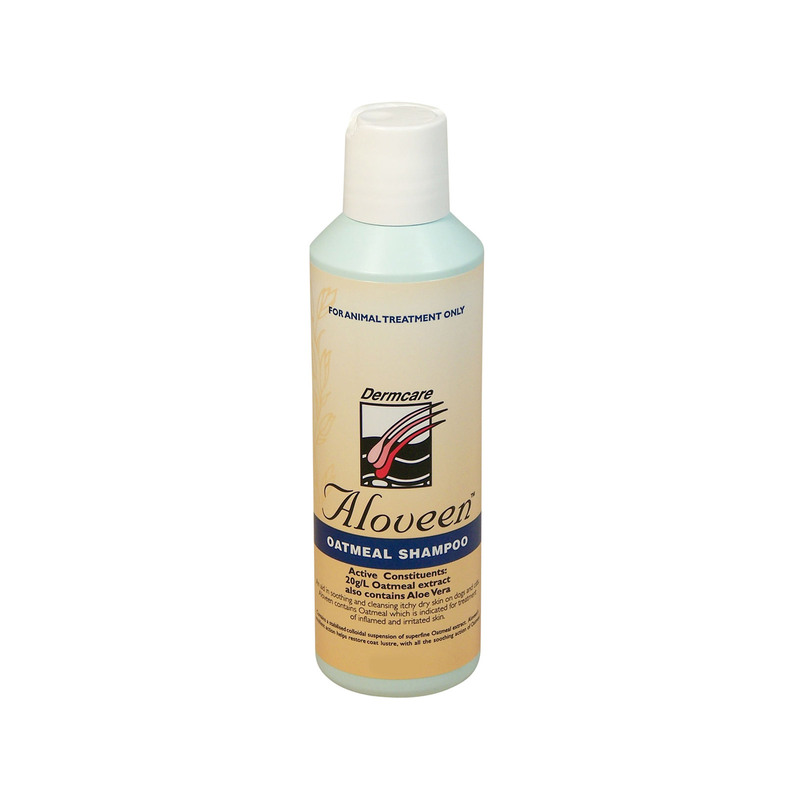 Without irritating dog skin, Aloveen Oatmeal Shampoo removes dirt, chemicals and allergens from pet’s fur. While soothing itchy and dry skin, this skin care shampoo maintains pH balance for healthy coat and skin. Among other ingredients, it contains superfine colloidal Oatmeal in a stable suspension that doesn’t break apart when the shampoo is used. The essential Oatmeal extract present in the shampoo gently cleanses the coat and removes dirt and bacteria. The other ingredient - Aloe Vera gel helps to rejuvenate the skin and leaves on the soothing effect without completely drying out the skin. Properly wet dog’s coat and apply shampoo on the animal at several parts. Massage gently to form lather. A sponge may be used to lather and penetrate the coat. Leave on for 5 to 6 minutes. Rinse thoroughly with lot of water. It is a good coat cleansing product for dogs. Aloveen thoroughly removes dirt without irritating the skin. It does not dry out the skin and coat. It leaves on the soothing effect for the longer time. This oatmeal shampoo is soap free and pH adjusted for animal skin. The cleansing formula is beneficial for pets with atopic and contact dermatitis. Followed with Aloveen Oatmeal conditioner, this shampoo offers maximum efficacy. After use, close the container properly. No side effects of using this product. It is really good at relieving itchy and dry skin. Ever since I have started using this shampoo on my dog I can find he has become more calm yet lively because he doesn't stay consumed in himself anymore and rather plays with me. My doggy has dry skin. I have been using this shampoo since last few weeks and the coat condition has improved a lot. It has become a lot smoother and shinier. Thank you so much!!! I own a greyhound who was suffering from dry flaky skin. His entire body was peeling and not just bits of dandruff that most dogs have. I tried lots of different dog foods, but to no avail. But once I started applying this shampoo the results have been amazing. Now the loose flaky skin has been covered. He also smells great and his coat has become a lot shinier. Thank you so much!!! I have been using this shampoo for years. I have had many different breeds of dogs and the results have been fantastic. My 2 small dogs have dry, itchy, sensitive skin, and this shampoo soothes it. Best of all, this shampoo smells lovely and fresh.